A Windows clipboard manager with optional cloud synchronization and AES encryption. 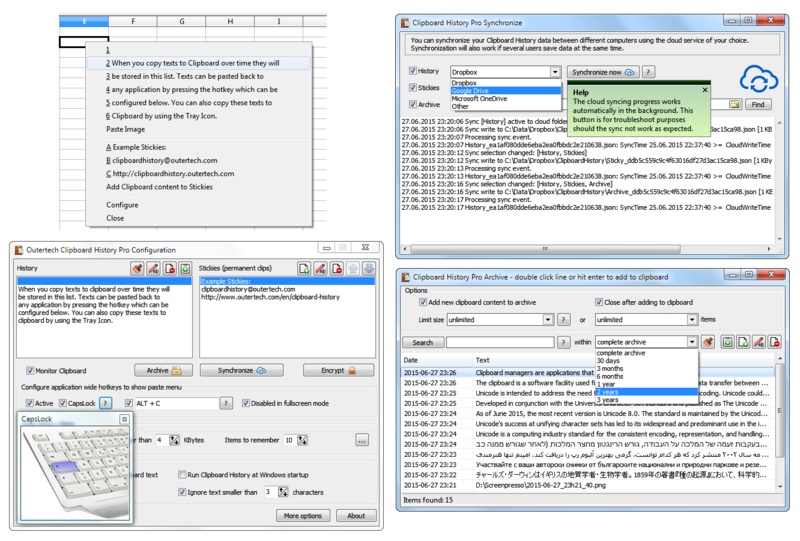 Pressing a hotkey or the usually idle and useless CAPS LOCK key will bring up a paste menu of last clipboard items and text snippets from every Windows application. Clipboard History Pro is a Windows clipboard manager with optional cloud synchronization and AES encryption. Users can keep a repository of text items copied to the clipboard before. Frequently used word phrases can be added to the global paste menu. Pressing a configurable hotkey, a tray icon, or the usually idle and useless CAPS LOCK key will bring up a paste menu of last clipboard items and saved text snippets from every Windows application. Extends the Windows clipboard, enabling you to copy and paste like never before. Take notes, jot down ideas and keep important information at your fingertips. Quickly communicate with standard messages and templates. Easily edit complex documents. ClipMagic is a powerful Clipboard Extender and Information Manager for recording, storing and sorting text and images, either automatically or manually, with special tools for recording URL\'s if the text is from an Internet site. Now you can copy as often as you like and paste all your clips at the same time. Before pasting, you can opt to paste the fully formatted clips (Fonts, colors and graphics) or to strip out the plain text only.